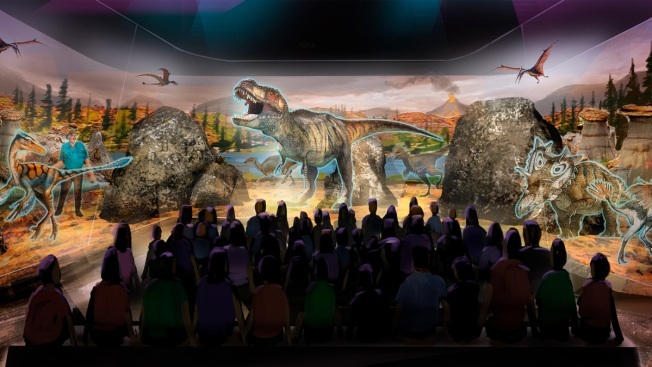 This undated artist rendering provided by BASE Hologram shows a prototype three-dimensional hologram display for a dinosaur exhibit. Jack Horner, a Montana paleontologist who consulted with director Steven Spielberg on the “Jurassic Park” movies is developing a three-dimensional hologram exhibit that will showcase the latest theories on what dinosaurs looked like. Horner and entertainment company Base Hologram are aiming to have multiple traveling exhibits ready to launch in spring 2019. Forget the gray, green and brown dinosaurs in the "Jurassic Park" movies. Paleontologist Jack Horner wants to transport people back in time to see a feathered Tyrannosaurus rex colored bright red and a blue triceratops with red fringe similar to a rooster's comb. Horner, who consulted with director Steven Spielberg on the "Jurassic Park" films, is developing a three-dimensional hologram exhibit that will showcase the latest theories on what dinosaurs looked like. He is working with entertainment company Base Hologram to create an exhibit that will let people feel as though they're on an archaeological dig, inside a laboratory and surrounded by dinosaurs in the wild. "I'm always trying to figure out a good way to get the science of paleontology across to the general public," Horner said in a recent interview with The Associated Press. "Like taking them into the field or taking them into my laboratory and then using the technology that we have to show people what dinosaurs were really like." That understanding of what dinosaurs looked like has changed a lot since the original "Jurassic Park" in 1993. For example, researchers now believe dinosaurs were much more bird-like than lizard-like, and scientists studying dinosaur skulls have found keratin, a substance that gives birds their bright colors. 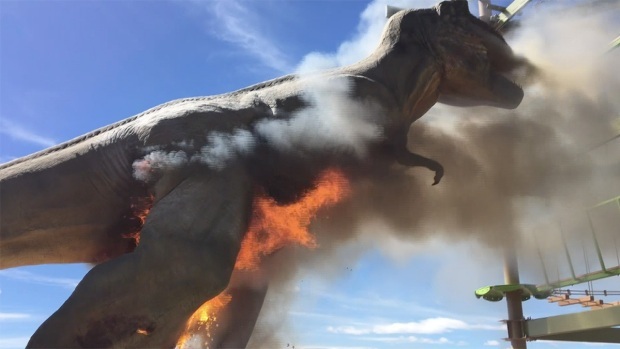 The co-owner of a dinosaur-themed park in southern Colorado thinks an electrical malfunction caused a life-size animatronic Tyrannosaurus Rex to burst into flames. The dinosaur at the Royal Gorge Dinosaur Experience burned up Thursday morning. "We can see at least areas that could be vividly colored, very much like birds, and there's no reason to make them different from birds," Horner said. Horner and Base Hologram workers have been developing the exhibit's story line for a couple of months, with plans to have multiple traveling exhibits ready to launch by spring 2019. The company wants to place them in museums, science centers and other institutions where they might spur debate among scientists who don't share the theory that dinosaurs were colorful, feathered creatures. "The controversy is OK because it makes people talk," said Base Hologram executive vice president Michael Swinney. Live performances using holograms have gained attention in recent years, notably through concerts that feature likenesses of dead performers such as Michael Jackson and Tupac Shakur. Until now, Base Hologram, a subsidiary of the live entertainment company Base Entertainment, has used the technology to put on concerts by late singers Roy Orbison and Marie Callas. As the field becomes more competitive, the company is seeking new areas to apply the technology, such as science, CEO Brian Becker said. Horner previously worked with Microsoft to create his dinosaur holograms that can be used with virtual and augmented reality technologies. 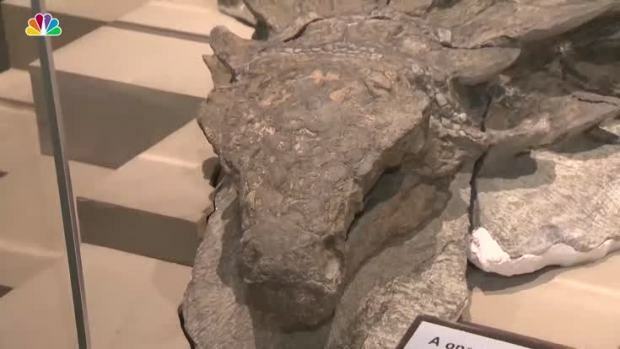 A 112-million-year-old fossil of a Nodosaur is on display at the Royal Tyrell Museum in Alberta, Canada. The museum claims that this is the "best preserved armored dinosaur ever found." He noted the technology used in the exhibit can be applied even more broadly, including by paleontologists in their labs. "What we do now is, when we want to envision something, we get an artist to paint it," Horner said. "Now, we're going to be able to create a 3-D immersive experience a lot better than a painting."